The small, wall-mountable design looks great in any home. So you can provide great coverage while your equipment keeping a low profile. Simultaneous dual-band technology gives you extended range throughout your home—for Wi-Fi® wherever you are. Eliminate dead spots and get the coverage you need for all your devices. 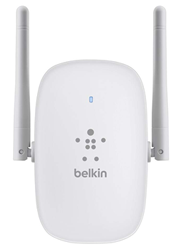 Extend Wi-Fi Coverage: Dual antennas deliver Wi-Fi where needed. Compact and Easy Setup: Small size fits with any décor and plugs into any wall outlet.